Wow. QEDCon finished for another year and Twitter server admins can relax. There are few things in life that can put a smile on your face for an entire weekend. 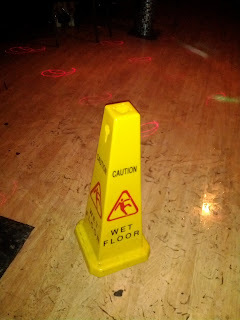 QEDCon is, and certainly did. Last year it was sometimes impossible to choose which room to go to, this year was no different. So many wonderful speakers on stage and interesting discussions around the bar it was always hard to know where to be or go. Everywhere I went I found the atmosphere to be welcoming and open. Deborah Hyde (@jourdemayne) gave a brilliant morning talk on werewolves, the InKredulous recording was hilarious. Evening comedy from Robin Ince and Alun Cochrane from the best seats in the house :) Can anyone explain the hell was going on with the mechanical baby and theremin though? Apologies to Trish (@cherryblack) for offending her with the sight of my bare, naked feet. Hayley (@HayleyStevens) is a blogger, paranormal researcher and confirmed ghost and was someone who I'd chatted to online on a number of occasions and I was delighted to finally get a chance to meet her in person. What a genuinely lovely human. 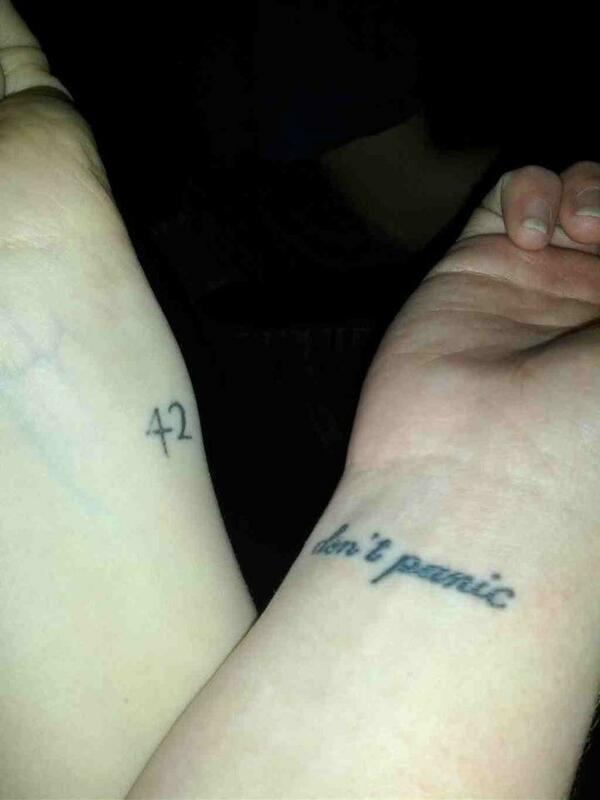 She was even up for me photographing her '42' tattoo next to @gellerby's 'don't panic' AND it was what would have been Douglas Adam's 60th birthday. Therefore, empirically, this is one of the finest images ever captured. Quite, quite perfect. Inspiration hit me and I had to create this and put it in one of the lifts. I'd like to thank everyone for the love it got, anyone know who the proud owner is now? @Arakwai? 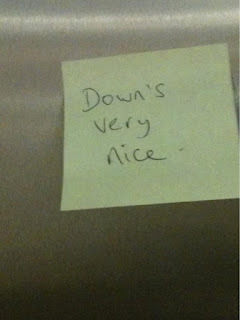 (You may have spotted other references around the hotel... ta to the staff that provided the Post-Its!). 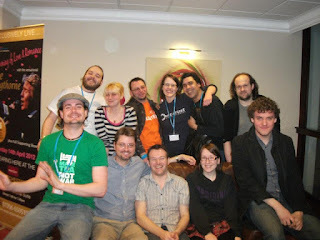 QEDCon is the perfect place to find and share random snippets of comedy. Delighted to have the chance to go and personally thank Richard Wiseman (@richardwiseman) for writing '59 Seconds' which found me at exactly the right time in my life. It's quite, quite brilliant and a must read. #nerddancing? Well, there was plenty. Sorry I was a little late for the first but I got sidetracked by George (@gellerby) and ended up discussing Darwin with Robin Ince (@robinince). Everyone that made it will no doubt agree I arrived in style and 100% redeemed myself with the selection of Frank Turner's wonderful 'Glory Hallelujah'. Spontaneous jazz hands at the end was one of my personal highlights! #There is NOOOOO God, so clap your hands together. Oh yes! The second bout of #nerddancing happened in conjunction with #nerdkaraoke had the additional fun factor as a result of featuring a very dangerous dance floor. #nerdsliding? Of course we did! 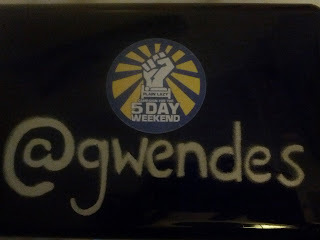 #QEDConAdvice: Book the Monday off work. A lot of love for my t-shirts so I've decided to offer them up as vector images, here's the first few of them including the ones I didn't actually print! Right-click on the links and save, then open with Inkscape if you want to do any editing. What next? Well I'm currently investigating running a summer skeptical mini festival, codename #Skeptival in the south, probably London. Anyone interested in getting involved or speaking please get in contact - it will happen if the community is behind it. Finally, sadly, QEDCon has decided that it is unable to marry me :( I am crying. Massive, massive amounts of love to you all and thank you for making this weekend one of the best I've ever had. Giles you were smiling the entire weekend, like so many others. All of our attendees played their part in this great big science soup and we tip our collective hat for it. I can't respond to every blog but I wanted to respond to yours because the hash tag was so important. Difficult second album....done. Lovely blog, Giles! I should be a wrist model. Also a man married a pub in the 90s, I think, so you and #QEDcon still have a chance! :) Cheers. Really lovely to see you and thanks for dragging Andrew along too! Unfortunately I may have let it slip that I'm still waiting to hear back from Helen Keen and so QEDCon has actually turned me down. It's a shame. Outstanding work from everyone involved. Real life is overrated. On Skeptics in the Pub. On the power of prayer. I write the words up there /\ Giles. Awesome Inc. theme. Powered by Blogger.